We’ve found a new obsession – Handy Andy vintage children’s tool sets. They were produced from the 50’s through the 70’s and you can find them today on Etsy, Craigslist and eBay ranging from $10 to $50 depending on condition. You might also grab one from an estate sale or garage sale. We love the gorgeous graphics on the outside and inside of the tool box and many times you’ll find the tools are still intact which says something about their quality. But what we love the most is what these tools meant to a generation of young makers who were thrilled to build their first project with the help of these tools. 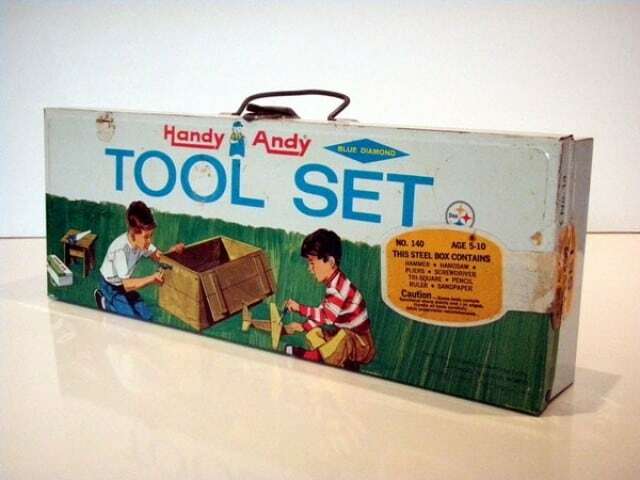 Did you grow up with a Handy Andy tool set? Do you still have yours?